If you are looking for a veterinary hospital that treats you and your pet like family, and offers the latest in diagnostics and treatment options, look no further. Sun Ranch Pet Hospital’s motto is “Quality Medicine, Compassionate Care”. We strive to provide your pet with the latest in veterinary advancements without forgetting they are a valued family member. Keeping your pet healthy requires teamwork. You know your pet better than anyone else. When you know something is wrong with your pet, or just not quite right, you can depend on the trained staff at SRPH. We will work with you to developa plan to address the problem and help your pet live the happiest, healthiest life possible. Dr. Rikia Park established SRPH in 1999. Our patients include: dogs, cats, rabbits, ferrets, birds, pocket pets and reptiles. We offer a variety of services ranging from routine healthcare and surgeries to chronic pain management and advanced dentistry. Our beautiful 7,000 square foot facility allows us to provide a unique hospital setting. To reduce your pets stress, we have separate spacious waiting rooms, examination rooms and hospital wards for dogs and cats. We also offer a complete pharmacy, a full line of prescription diets, all breed dog and cat grooming and separate boarding areas for dogs and cats. State of the art equipment makes it possible to provide outstanding medical care for your pet. Digital radiography, ultrasound, cryotherapy, laser therapy, surgical vital monitoring, digital dental radiography and an in house laboratory are just a few. Sun Ranch Pet Hospital’s website offers a number of resources discussing preventative care, nutritional and behavioral needs. To help make your pet care more affordable, we offer pet insurance, wellness plans and care credit. 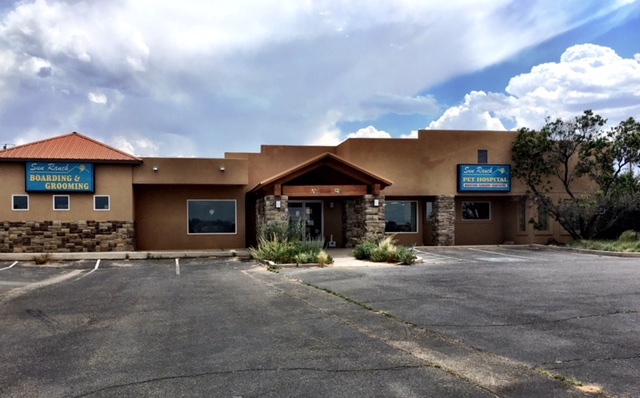 We are conveniently located in Los Lunas just west of I-25, near the Starlight Cinema. Subscribe to our news letter, like us on facebook, or you can reach out to us for more information or directions on our Contact Us page. We look forward to becoming part of your family. Call Us Today! "I've been going here for almost 10 years now and I continue to go even though I moved from Los Lunas to Albuquerque 2 years ago. It is worth my time to be treated so nicely by everyone on the staff and my cats always get the best care. I love this place!"